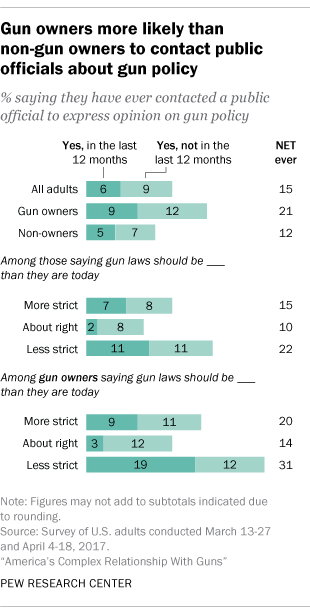 Large majorities of Americans support several specific policies intended to limit access to guns, including expanded background checks and restrictions on sales to the mentally ill. But relatively few Americans actually contact public officials to express their views, according to a Pew Research Center survey conducted in the spring. The Center’s survey found other indications that gun owners are more politically engaged than non-gun owners. 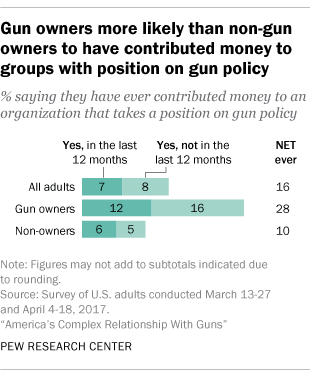 For example, while only 16% of U.S. adults say they’ve ever given money to an organization that takes a position on gun policy, gun owners are again more likely than non-gun owners to say they have done so. Among gun owners, 28% say they have ever given money to an organization like this, including 12% of who have done so in the past year. The same is true for just 10% of non-owners, including 6% who have done so in the past year.